I have had a dreadful week in the kitchen. I’ve attempted three new recipes and every single one was not fit for human consumption. It’s so frustrating to take the time to prepare ingredients, conceptualize a recipe and then have it fall short. So if you think that everything I make is beautiful and camera-ready you are mistaken. It has taken years and a lot of terrible kitchen accidents to make me into the cook I am today. When I meet someone who thinks they can’t cook I always try to relay how challenged I was in the kitchen for years and how I basically taught myself (with a little help from Martha Stewart) to cook. Luckily I did play with my new lighting set-up last night and photographed our dinner so I have something to share with you. We have pasta night a few times a month and we’ve been trying to lighten things up a little. 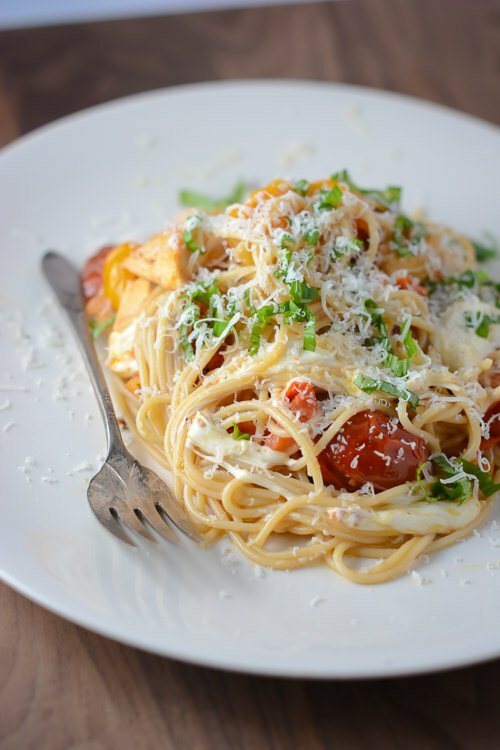 I used a whole grain spaghetti and paired it with some roasted tomatoes and chicken for an easy dinner. 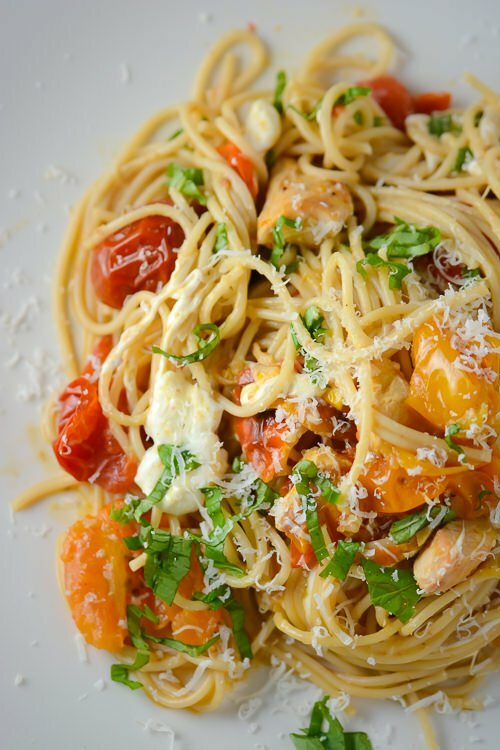 For a lighter take on pasta, try this whole grain pasta dish with roasted tomatoes, chicken and mozzarella. Pre-heat the oven to 450 degrees. Line a baking sheet with parchment paper. 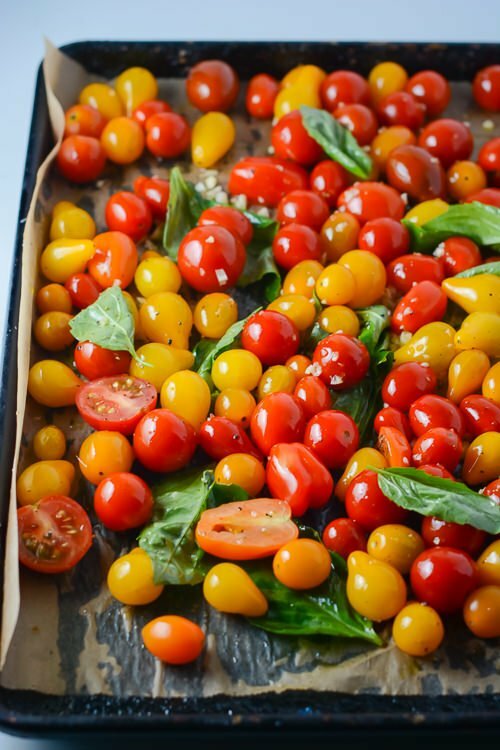 Finely chop the garlic and add it along with the tomatoes to the baking sheet. Add a few sprigs of basil and toss with one tablespoon of olive oil. Season with salt and pepper and roast until tomatoes have softened and started to brown 15 to 20 minutes. Meanwhile heat a skillet over medium heat and add the remaining tablespoon olive oil. Season chicken with salt and pepper and cook until browned on both sides and cook through, about 8 minutes. Add the roasted tomatoes to the chicken and cook for 2 minutes. Cook pasta according to package directions reserving one cup of pasta water before draining. 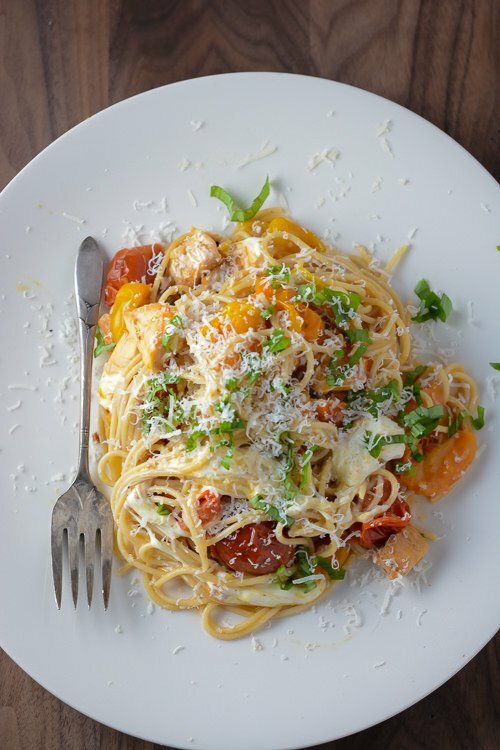 Add the pasta to the tomato mixture along with ¼ cup of the reserved cooking water and cook until the sauce is slightly thickened, adding more water if necessary to coat the pasta well. Cut the mozzarella into ¼-inch cubes and add to the pasta. Cook for 2-3 minutes until the cheese has melted slightly. Taste and adjust seasoning if necessary. Roll the basil leaves tightly together and then thinly slice crosswise. To serve sprinkle with the parmesan cheese and the basil. I thought today I’d share a few of my favorite ladies with you today. I love the mood all three of these songs evoke. I have a weakness for folk singers, especially those that write their own music. I want to kick up my feet around a bonfire and put them all on repeat. I hope you enjoy listening to them all! This recipe looks just as divine as your food always does. Glad I’m not alone in getting super excited to make something that just turns out meh. Love that you’re honest about that! Love-love reading your blog! Part of cooking is the adventure of not knowing how things will always turn out but it can be frustrating when it fails. Thanks so much for reading the blog! I took a look at your blog, what wonderful photographs! Thanks for those musical selections!!!! I’m glad you like them Johanna! It’s a lot of fun for me to share my favorite tracks with you! Thanks! 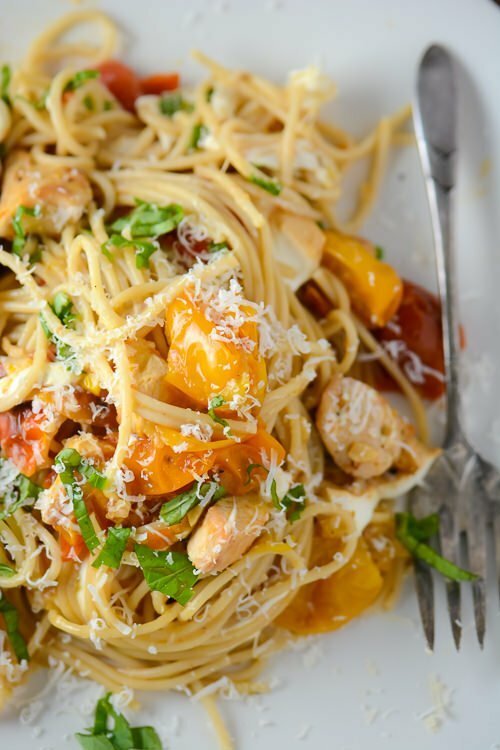 I’m pinning this to use in summer when my cherry tomatoes & basil are just begging to be used! Yes, it would be so much better with homegrown tomatoes but sometimes in the winter I can’t help myself and buy what I can find. The roasting makes even the poorest store-bought tomatoes worth eating!